Information about Sun Van Paratransit Service. If you need assistance with any of this information or if you need this information in accessible formats, please call (505) 243-7433. If you need assistance completing this form, or if you need this information in accessible formats, please call (505) 243-7433. before your certification interview. Learn about our wheelchair policy. 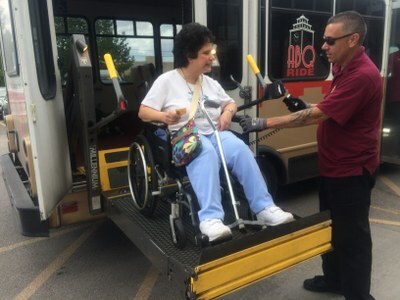 Sun Van, ABQ RIDE's paratransit service, provides accessible transportation to persons residing in or visiting the metro area whose impairment makes it impossible to ride the fixed route service. Reasonable accommodation and information in accessible formats is available upon request by calling (505) 724-3100. ABQ RIDE Paratransit provides origin-to-destination service to and from any address in Albuquerque and most of Bernalillo County. Door to Door service is also available upon request at time of reservation. Service hours are the same as the fixed-route service. The fare is $2 for each one-way trip, which can be paid for with coupons or cash. Coupons are available at ABQ RIDE. Call 243-Ride (V/TTY) for other sales locations. Advance reservations are required, and reservations are accepted three days in advance when made Saturday through Thursday; on Fridays, reservations are accepted five days in advance. Rides must be cancelled two (2) hours prior to the scheduled ride. Download "Sun Van and You" A Passenger's Guide to Public Transportation for Persons with Disabilities - Word DOC version. Download "Sun Van and You" A Passenger's Guide to Public Transportation for Persons with Disabilities - PDF version. Please call 505-724-3151 or email [email protected]. Please allow two business days for a response.